Your IPO Invitation: Fortune 500 CEO “quits retirement” to launch a new company. He just invested $25 million of his personal savings. Now’s your chance to get in on the ground floor. Click here now – say YES to your IPO shares. 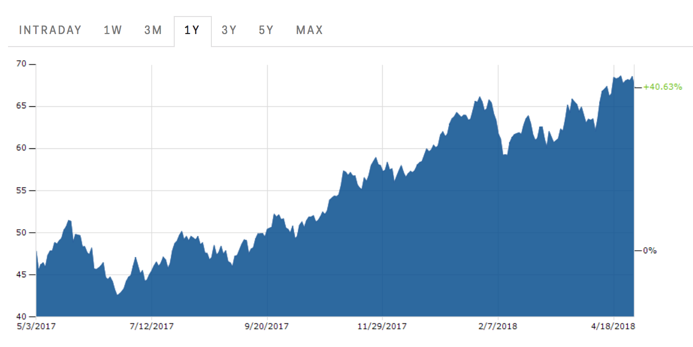 There’s a new bull market taking off – and it isn’t tech stocks or cryptocurrencies. Instead, it’s the most commonly traded commodity in the world. And it’s responsible for up to 6.5% of the global economy! Just check out this chart – it’s surged 40.6% in the last year! You’re looking at a 12-month chart of West Texas Intermediate (WTI) Crude Oil. And the price has jumped from $45 to $68 in the last year. One new company is uniquely positioned to profit from rising oil prices. Click here for details. 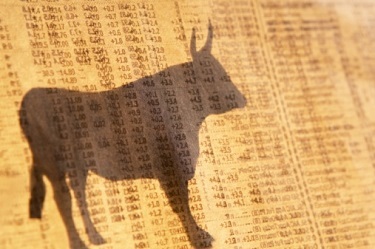 So, what’s behind the move for oil prices? Back in November 2016, the OPEC cartel agreed to cut daily oil output by 1.2 million barrels per day. The goal was simply to put a floor under falling oil prices. And those production cuts have been extended through 2018. Meanwhile, the U.S. oil producers continue drilling and expanding market share. This year, U.S. oil production will reach record levels of 10.7 million barrels per day. And that’ll exceed previous production records back in the 1970s. America has embraced these new fracking technologies. And that’s led to a significant drop in the cost of producing oil. As a result, the International Energy Administration (IEA) expects the U.S. will surpass Saudi Arabia to become the world’s largest oil producer within five years. And American energy independence will be a reality. Here’s what that means for you . . .
Long ago, most Americans exited their oil stock positions. Nearly everyone SOLD stocks like Exxon (NYSE: XOM) and Chevron (NYSE: CVX) after the collapse in oil prices. As a result, energy stocks are “under owned” in most investment accounts. And that means a comeback for oil prices could create a rush of buying activity. Now, it’s possible that you could beat the market buying a popular energy ETF. But there’s a far better situation on the horizon. That’s because one former energy executive is launching a new energy company. He’s personally investing $25 million. Plus, one of America’s best private equity firms is investing $300 million in his new company. Now’s your chance to BUY these IPO shares for just $10. It’s an unusual stock offering – allowing you to grab early shares right now. Click here now for details (it’s FREE).